Not afraid of heights? Good, as it’s almost time to take to the skies in Ace Combat 7: Skies Unknown! On January 18, you will be able to strap yourself in the cockpit of the most advanced war planes, navigate through treacherous clouds and engage in fierce dog fights with friends by your side. Or enemies. Ace Combat 7’s multiplayer allows up to eight players to join the aerial battle in either Team Deathmatches or Battle Royale game mode. Of course, before you take flight and rule the skies of Strangereal, you will want to make an impression on your foes: just as in the campaign mode, you will be able to customize your aircraft with a wide range of options, including items exclusive to the multiplayer mode. These items will increase the efficiency of your aircraft and weapon to give you the edge in combat. 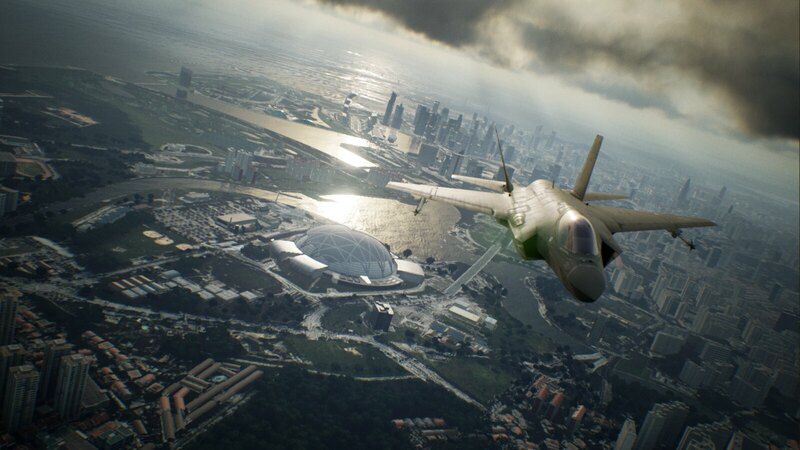 Ace Combat 7: Skies Unknown promises intense dog-fighting in beautifully rendered cloud-filled skies and highly detailed cityscapes. The photorealistic scenery enhances the sense of unparalleled speed and sets the stage for the most engaging face-offs in the franchise’s storied 20-year history. To upgrade your aircraft’s capabilities and show off to your rivals while performing daring aerial stunts, you will be able to choose from more than 100 types of enhanced parts, 120 emblems and 190 nicknames. Once you’ve loaded your plane with the coolest arsenal and given yourself a fearsome look and alias, make sure to build a strategy to prove your worth as a pilot. The basic rule of survival in Ace Combat 7? Shoot down, or be shot down. Easy enough to remember. Take down the enemies that come into visual range, but also make sure to find out who you need to target first to come out on top. Your victories will be celebrated — players with the highest rankings will be decorated with a star mark. This will also make them prime targets in battle, as you will be rewarded with high scores for taking them down! So, are you ready to pick your fighter, gather your comrades and pilot the skies of Strangereal? We hope you are, because the wait is almost over — you will be clear to engage on January 18. For further immersion in Ace Combat 7: Skies Unknown’s realism, solo players will be able to complete exclusive missions developed specifically for PlayStation VR.